Discussion in 'Nigeria News, Politics' started by Admin, Jan 2, 2018. The Arewa Consultative Forum (ACF) has expressed worry over the raging feud between Dangote Group and BUA Group over the ownership of a mining site located in Okpella area of Edo State. 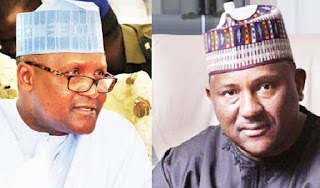 The conflict over the rightful ownership of Mining Lease No 2541 involving chairmen of the two leading companies, Aliko Dangote and Abdulsamad Rabiu has dominated discussions in the public space for the past few weeks, especially within the business circle. Both sides have engaged in accusations and counter accusations, including name calling in the media. There had been frantic moves by eminent persons in the country to settle the business row, the latest being the intervention by the Emir of Kano, Muhammadu Sanusi II who had urged the business moguls, both natives of Kano, to sheathe the sword. Also, Arewa Consultative Forum, (ACF), the pan Northern group has waded into the matter in a bid to end the dispute once and for all. In the last couple of days, the forum and the Northern elders held several meetings where the dispute between Dangote and BUA was seriously discussed. It was gathered that the forum expressed concern over the scuffle and has concluded arrangements to invite the two business giants to a meeting to be chaired by Emir Sanusi II in Kaduna. The forum which is determined to ensure an amicable resolution of the impasse, also lauded Emir Sanusi II for his timely intervention. Emir Sanusi II, who by virtue of his position as the traditional ruler of Kano and father to all, opted to intervene in the squabble between Dangote and BUA, with a view to finding a lasting solution to the scuffle. It should be noted that several interventions by the Ministry of Mines and Steel Development, the Edo government and other stakeholders have proved futile. In the course of the altercation, it was revealed that the two companies got their licences from third parties. While BUA obtained its licence from the old Bendel Cement Company through its privatisation, Dangote Group obtained its licence from a company called AICO (Ado Ibrahim & Co) Limited. The disputed area is at the boundary between Kogi and Edo States, but officials have said that mineral titles are not by state boundary but by the geographic coordinates, which means they can fall in any state. The Mining Cadastre Office, however, is insisting that BUA overlapped the AICO’s title and that it has no case. Meanwhile, the case has brought to the fore the weak administration of data of mineral sites in the country, as the titles claimed by both parties are from the same ministry of Mines and Steel Development. While the BUA group presents mining rights in ML 18912 and ML 18913 in Obu, Okpella in Edo State, Dangote claims right in ML 2541 located in Okene, Kogi State. Both parties presented evidences that the area where the mining is taking place belong to them and was duly signed by the mining authorities, the ministry of Mines and Steel Development and the Mining Cadastre Office. Recently, the disagreement between the two firms compelled the Federal Ministry of Mines and Mineral Development to issue a directive that the Obuh mine located in Okpella, Edo State, be shut down. Edo State governor, Godwin Obaseki, had disclosed this while meeting with members of the Okpella community at Government House, Benin. He said, “There are multiple claims and they have all gone to court. We have a letter from the Federal Ministry of Mines and Minerals Development instructing that the party currently mining that particular site should vacate it, pending the outcome of the decision in court”. Prior to this action, BUA Group had accused Dangote Industries of using armed personnel to take over the site and mining illegally. The company also accused the Ministry of Mines and Steel of frustrating its operations, saying it had written to the Presidency seeking its intervention. Dangote Industries, in its defence, claimed BUA Group was illegally mining on a site it had made all the required payments for. Arewa Youths React To Buhari's Lazy Nigerian Youths: "We Are Disappointed"